I wanted to make a pretty dish so I made this. 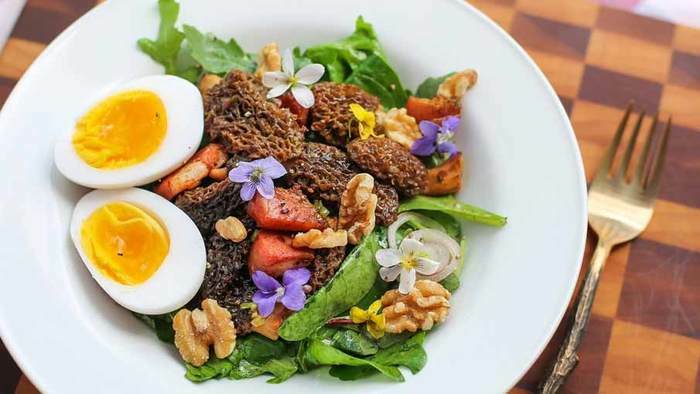 My fiancé, Rick, and I had a pretty good morel mushroom season -- considering we only hunted public land-- and to offer a low carb, “paleo” dish, a hearty, protein-rich salad fits the bill. Any bacon will do for this recipe but to complement the morels, we used high quality, thick-cut Duroc bacon that our local butcher makes. I expect that this was the last of the fresh morels for the year—things are winding down near Omaha. So this recipe is one last hurrah for the season. Common during morel season are also woodland violets, which come in a variety of colors. I was able to find three different colors in one area: violet, white and yellow. They were so pretty that I had to do something with them. One problem with woodland violets is that they wilt quickly, especially during a hot day of foraging. To perk up the flowers, dampen a paper towel and place it in a zip top bag. Place the flowers into the bag and refrigerate with the bag open. They will come back good as new and will keep a few days this way. However, woodland violets don’t taste like anything and are completely optional. 1. Wash mushrooms with cold water and drip dry for about an hour. Meanwhile, place duck egg(s) in a small saucepan and fill halfway with water. Cover and bring to a boil, then cook egg for 7-8 minutes for a custardy yolk. Meanwhile, prepare an ice bath. 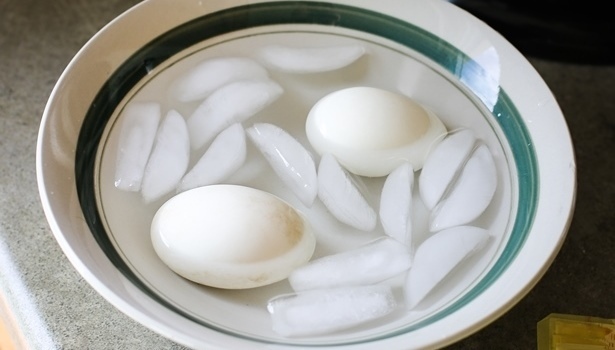 Place cooked egg into the ice bath to cool. When ready to serve, peel the duck egg(s) and cut in half. 2. Peel shallot, and then thinly slice half of it and mince the other half. In a large skillet, heat olive oil for a medium-high heat. Cook morels (in batches) until browned. 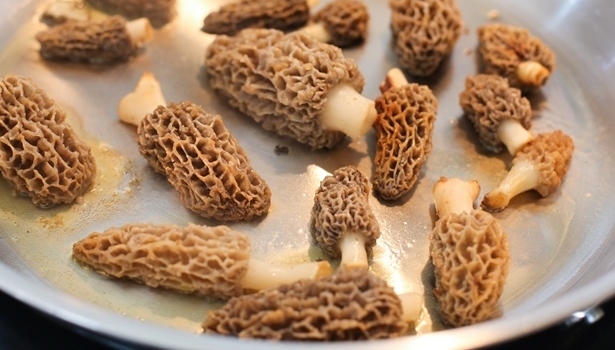 Return all morels to the pan and sauté for 1 minute with minced shallot. Then add salt, pepper and chopped green onion. Transfer morels to a bowl and set aside. 3. 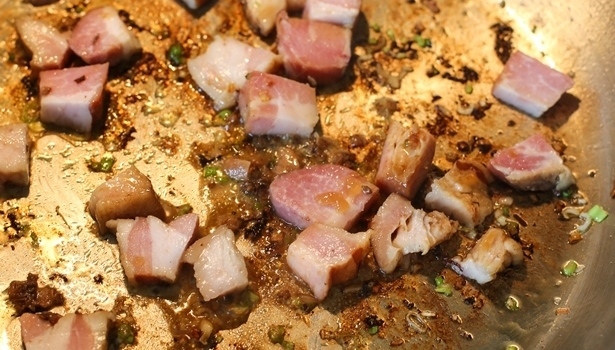 Lower heat to medium-low and add bacon to the pan. Render bacon until desired doneness. 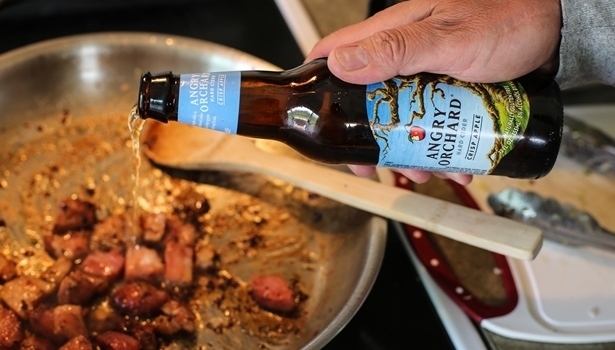 Add a splash of alcohol if desired to deglaze the pan – I happened to be drinking hard cider at the time. Then scrape the pan with a wooden spoon to release the flavorful bits stuck at the bottom of the pan. Return morels to the pan with the bacon and allow alcohol to evaporate. 4. Toss spring greens with the sliced shallot, French vinaigrette, salt and pepper. Assemble salad into bowls and top with the bacon and morels. Garnish with halved duck egg, walnuts and if you have them, woodland violets. I forgot to get dried cranberries or tart cherries, but I bet they’d be tasty in the salad, too.